This program is read by Carl Pope and Charles Pellett with an introduction read by the author. 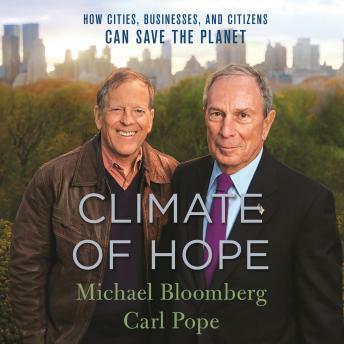 From Mayor Michael Bloomberg and former head of the Sierra Club Carl Pope comes a manifesto on how the benefits of taking action on climate change are concrete, immediate, and immense. They explore climate change solutions that will make the world healthier and more prosperous, aiming to begin a new type of conversation on the issue that will spur bolder action by cities, businesses, and citizens-and even, someday, by Washington. Bloomberg, an entrepreneur and former mayor of New York City, and Pope, a lifelong environmental leader, approach climate change from different perspectives, yet they arrive at similar conclusions. Without agreeing on every point, they share a belief that cities, businesses, and citizens can lead-and win-the battle against climate change, no matter which way the political winds in Washington may shift.